ZYLKENE is a natural product that can help support your pet through situations they may find difficult to cope with. ZYLKENE is a complementary feed for cats and dogs which contains a natural product, derived from casein, a protein in milk. This molecule is well known to promote the relaxation of newborns after breastfeeding. ZYLKENE can help support dogs and cats in situations where they find they need to adapt their behaviour to cope. These include kennel and cattery stays, house moves, arrival of a new pet or baby, sudden noises (e.g. fireworks), travel, vet or groomer visits and Christmas festivities. It can also help cats cope better in a multi-cat household. There are many ways our pets can respond to new and unpredictable situations and not all animals respond in the same way. It is ideal to use for support during a stressful situation, or for best results given before the event of predictable stress. Because ZYLKENE is a non-sedative, milk-derived foodstuff, it is free of side effects and can be used for prolonged periods safely without the risk of hypotension, sedation, digestive, urinary, or heart problems. 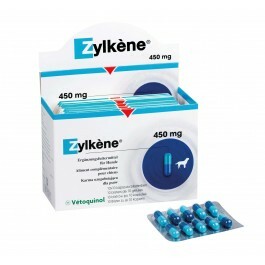 With just once daily administration, Zylkène is very easy to give and because Zylkène is a product derived from milk, it is also very palatable and well accepted by both dogs and cats. By opening the capsule and mixing with your pet’s usual food or as a treat. By mixing with liquids, such as the oil from a tin of tuna (Zylkène is water soluble). Ideally Zylkène supplementation should be started a few days before required, for example before the fireworks season begins or before a kennel or cattery stay. Our pets are often clever at associating differences in our behaviour and relating them to an upcoming change in their environment or lifestyle, especially when the activity is repeated. These changes in our behaviour are known as ‘cues’. An example is when your dog or cat may have learned that the activity of packing a suitcase means a stay in the kennel or cattery for them. This is a typical situation where Zylkène should be started the day before you get your suitcase from its normal storage place. For long term scenarios such a new born baby into the family, Zylkène should be given for a minimum of 1-2 months or even longer if necessary. Our pets tell us how they are feeling by exhibiting different behaviours and demeanours which are signals we notice. Sometimes they are very noticeable, others may be less so, when perhaps we think or say to others “they don’t look themselves”. This change in behaviour is the point at which we should take notice to help them overcome their uneasy feelings. It’s important to remember that every animal is different, this includes their responses to the changes they experience e.g. a new baby or person in the family may give rise to behaviour in cats such as staying out longer or soiling in the house. When dogs are in kennels, it’s not uncommon for them to exhibit pacing and excessive barking which gives rise to them going home with a hoarse bark. Any change from their normal environment could result in them not managing to adapt. Cats are more likely to show how they feel by ‘withdrawal behaviours’ such as hiding and lessening interaction with family members. If you think your pet may not be coping, first see your veterinary surgeon. Your vet will tell you if there is a medical cause for the behaviour - this may involve tests e.g. blood or urine samples. They will then discuss management options with you which, for a medical cause may involve different products and include behaviour management techniques. ZYLKENE is a natural product that can help support your pet through situations they may find difficult to cope with. ZYLKENE is a complementary feed for cats and dogs which contains a natural product, derived from casein, a protein in milk. This molecule is well known to promote the relaxation of newborns after breastfeeding.